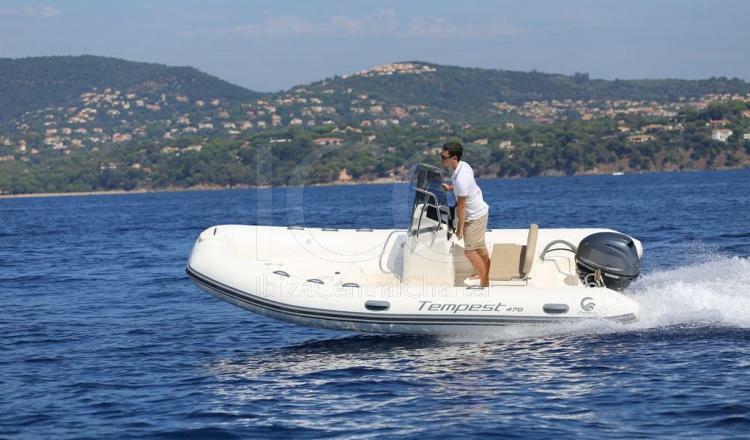 The semi-rigid pneumatic boat Capelli Tempest 470 is the opportunity for all those people who without lincence wish to sail on the Ibiza's coastlines independently and autonomously. This semi-rigid pneumatic boat has almost 5 meters in length been the answer for all of those people who want to sail across the Ibiza's coastlines independently and just accompanied by their friends or family. Capelli Tempest 470 does not need licence to be driven, so it is perfect for the first contact with the Mediterranean sea being yourself the skipper of your boat. Capelli Tempest 470 is available to rent for a full or half day, becoming the best opportunity to discover small beaches that Ibiza hides. Moreover you can eat in the best views Ibiza's restaurant, chosen by yourself, thanks to its table and bimini top you can enjoy having lunch in this paradise and relax in the bow's solarium. To make this step easier for you, by courtesy you will find a welcome pack of drinks and snacks, our goal is your satisfaction, and Capelli Tempest 470 mooring in Marina Ibiza port with capacity till 6 people is the best first step to got it. - Mooring in home port. - Full insurance from guarantee. - Initial and final cleaning. - Selection of drinks (water, soft drinks, beer) and ice. - Transport to other ports in Ibiza. 50% when booking by bank transfer, 50% when boarding. In case of hire cancellation by the client, the amounts paid shall be kept by the lessor by way of compensation. Mid Season: May 1 - July 31 and September 1 - September 30. Low Season: rest of the year. Price 50% Medium Season (except in half days) subject to availability. Remarks: Available to rent half days. - 10:00 am to 2:00 pm or 4:00 pm to 8:00 pm.